The proposed service from Boston – including stops in Brunswick, Bath, Wiscasset and Newcastle – receives widespread support at a public forum. 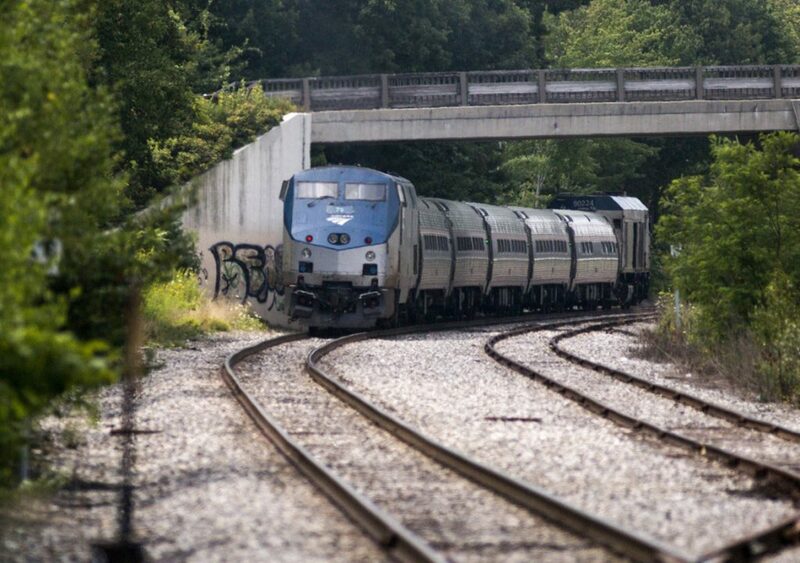 ROCKLAND — Proposed weekend summer passenger rail service to Rockland is an initial effort to “test the waters” for the demand for train ridership, the head of the regional rail authority told about 70 people at a meeting Wednesday night. The proposed pilot project was welcomed by nearly all those who attended the forum by the Northern New England Passenger Rail Authority. Pat O’Brien of Fiore Artisan Olive Oils & Vinegars said it was a great idea and asked the railroad authority to work with local businesses to attract riders. Betsy Rich said she lives near the tracks, but supports the return of passenger rail service. “It doesn’t bother me to hear the train whistles. This means people are coming to Rockland, spending money, and creating jobs,” she said. State Sen. David Miramant, D-Camden, expects the service will bring a lot of people from Boston who don’t want to drive. He said there were so many events and places to go within walking distance of the train station. “When the word gets out, it will be a big boon without the traffic,” Miramant said. Tom Wilhite of Camden said this was a phenomenal opportunity for Rockland, Camden and the entire midcoast. Elizabeth Burrell, who lives near the station and also works for the Penobscot Bay Regional Chamber of Commerce, said there are many restaurants, museums and stores within walking distance of the station. Rockland resident Doug Curtis Jr. said the proposed schedule was more attractive to people in Boston coming to the midcoast rather than Rockland people heading to Boston. He asked if the schedule could be more flexible to better serve Rockland-area residents. Patricia Quinn, the rail authority’s executive director, said there was little flexibility this first year. She said the proposed extension of Amtrak train service to Rockland was being done with existing equipment and crews. She said there was no money for additional runs under this project. “We’re looking this as a start, to test the waters,” Quinn said. The proposed schedule that could start in July would have a train leave Boston at 5 p.m. Fridays and arrive in Rockland at 10:10 p.m. The service would run through September. On Saturdays and Sundays, the train would leave Rockland at 10 a.m. and arrive in Boston at 3:30 p.m. A train also would leave Boston at 9:45 a.m. both Saturday and Sunday and arrive in Rockland at 3:10 p.m. The train would then return to Boston, leaving Rockland at 4 p.m. and arriving in Boston at 9:30 p.m.
She said someone from Rockland going to a Red Sox game for example would likely stay overnight before returning. Curtis said the rail authority should make at least a three-year commitment for the service as a good faith act to Rockland. The train station is owned by the Maine Department of Transportation, but Rockland would be responsible for installing lighting outside the station as well as maintaining the platform. City Manager Tom Luttrell does not yet have an estimate on the cost of lighting, but said the work to the platform would be minimal. Quinn said there was no price set yet for tickets. The current cost to ride the train from Brunswick to Boston is $30, but seniors and children get 50 percent discounts. She said more information will be available in March. Addressing questions about the impact the trains would have on Rockland, Quinn said they would not stay overnight in Rockland but would return to Brunswick. A forum was held Monday in Newcastle. Other forums will be held in the next two weeks in Wiscasset and Bath, which are planned stops north of Brunswick.